Hi, Brenton here, welcome to Feedback Friday number 26. 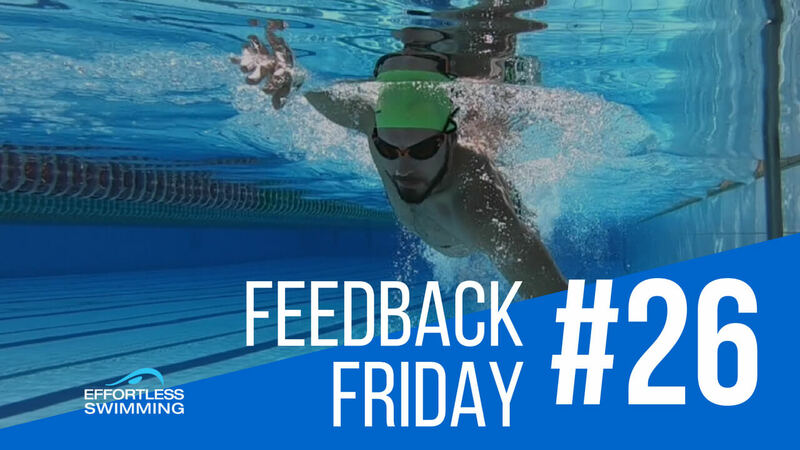 In today’s episode, we’re looking at a swimmer who came to one of our clinics recently, his name is Matt, and in the space of the three and a half hour session, he was able to bring his threshold pace down about six seconds per 100. Now, obviously, it’s gonna take a few weeks to start to lock in those changes, make them automatic. It doesn’t happen like that straight away. It’s going to need a little bit of practice to really lock that in but what I wanna show you here is two things. So, two of the key changes that we made in the clinic was number one, the depth of the hand during the reach and extension phase. Number two is we improved his catch and his pull through. So let’s take a look at the first one which is the depth of the hand on the entry. Now, this is at the start of the clinic. You can just see there, let’s slow it down a little bit. On the hand entry, alright, fingers enter first, that’s great, that’s what we wanna do, and they enter a good distance out in front of his head. You can just see here though, the hand just stays a little bit high for a little bit longer. Probably more pronounced on the right-hand side. Again, this right hand enters nicely but see how it sort of skims the surface a little bit and it’s not until about here that he gets into a good starting catch position with the fingers below the wrist, wrist below the elbow. So, both hands are just staying that little bit high. Now the other thing that you’ll see here when we look at the above water view is he enters the water quite, probably a little bit too gently, a little bit too softly, and we’ll bring that back again just to show you. There’s just not enough assertiveness to it, for someone who’s training to swim open water, so Matt’s a triathlete, he’s gonna have a wetsuit on for most of his swims and when it comes to racing open water, you’ve gotta have quite an assertive entry. 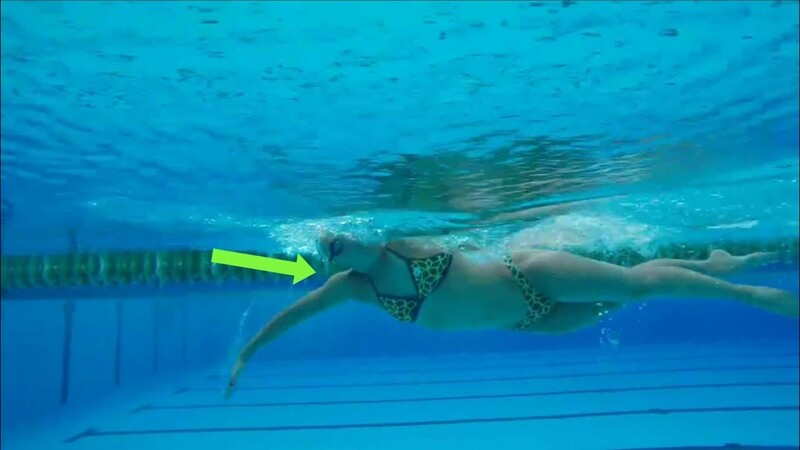 I know there are some coaches and some methods that teach you to enter very gently and comfortably but if you’re looking really to go fast, that can be good for longer distance swims but if you’re looking to go fast, quite often you’ve really gotta get the hand in with some speed. The reason for that is, your arm weighs a couple of kilos, so you’re bringing that arm over top of the water, that generates momentum and if you slow the hand down and you just try and control it too much on that entry point, you’re losing that momentum, you’ve gotta keep it going so that’s why for most swimmers who are racing open water or they’re racing triathlon, they might have a wetsuit on, it gets choppy, you’re going to need to enter the hand with a bit of speed so don’t go too softly and gently with it and that’s why we don’t teach just one method, we adapt it to whoever we’re working with. Everyone’s training for different events and different reasons so with Matt, training for a triathlon, that’s why we worked on getting this hand a little bit deeper. So that was the before shot, let’s have a look at the after shot. So we still got a little bit of work to do here in terms of getting the hand in a bit faster with a bit more speed but you can see how much better this depth is. So I’ll just bring it back there, that right hand enters in a great spot, fingers versed then he extends forward and he gets down to this starting catch position which is pretty much shoulder armpit depth, he gets there straight away. So much better, he’s not putting the brakes on, letting that hand come up. Again with the left, so much better. So I’ll just play it through for you. So that’s a much better depth there. Now I had him swim just another couple laps here. Just work on getting that hand in a little bit quicker here. So this is obviously not him cruising, this is him working reasonably hard here but you can just see how much better that entry is in. Maintains that speed of the hand, over the top and in the water. So, that’s gonna serve him very well when it comes to racing. It might be a little bit more tiring early on while he starts to build up the strength to be able to do that for a little while, but after four, five, six weeks he’s probably gonna be able to maintain that sort of rating, entry, hand speed quite a bit easier. So that’s the first thing that we worked on. Now, the second thing is the catch. Alright, so, you can see here, if you’re looking at the left arm, in this catch position where he’s just finished the catch, you can see he’s kind of in that straighter arm position, so in terms of has he got a high elbow, no, it’s probably in that more straighter position. It’s not far from it, he’s swimming 127s as his threshold pace so he’s still a very good swimmer and this catch isn’t bad by any means but we can definitely work on it and improve it. The right arm you can see here as he’s pulling through, similar thing it’s in that straighter position. So, in terms of looking at has he got a high elbow, no if we draw a straight line from the shoulder to the hand, that elbow is not in front of that straight line. So that was the before shot. Now after, for quite a few of these strokes, he gets into a higher elbow position which is fantastic so, you can see here, alright, let’s bring it up right there. So this stroke here, starting to show the signs of a higher elbow catch and you can see there still in a straighter position but on the next stroke, he starts to get on top of it right about here, alright. So you can see that position. On this stroke he’s got it, that elbow’s slightly forward of that straight line from the shoulder to the hand which is excellent. I don’t normally expect to see too much of a change within the space of three and a half hours because some of the things take a while to, or habits take a while to break but you can see here he’s managed to do that and I think this is probably one of the main reasons why he was able to get his sort of threshold effort pace from 127 down to 121 in just a session is that catch position. Now let’s look at the left hand, I think he does quite a good catch on this one too. Again, you can see that left arm is or left elbow is forward there so starting to get a couple of really good strokes here with that higher elbow position and this is what I normally see, sometimes when you’re making changes you’ll nail it on one stroke, you’ll go back to your old ways in the second stroke, just while you’re making changes, you’re not gonna get it right every single time so it does, certainly takes time to make those changes but you can see there just in the space of three and a half hours, able to make some really good changes. Now, because obviously, the clinics that we run here in Australia, not everyone’s located in Australia, I think most of you are, you’re in the states, and also in Europe, New Zealand so you’re in quite a few different places so what I’m thinking about doing is actually doing like a virtual clinic so recording what we teach at the clinics and then putting that out as a video, so if that’s something that you think would benefit you, just let me know in the comments below and that’s something that I can get done in the next couple of weeks so. I think the way that we teach the clinics, we don’t go through a huge amount of drills, it’s really just a handful, but we do cover quite a few things and if you’re looking for, or if you wanna attend a clinic but you can’t ’cause you’re overseas, then just let me know and I’ll look to record a virtual clinic for those of you that are interested in that. Now just one last thing here too that I just wanna show you is right here. Now, one of the things that I like to sort of look at and a friend of mine, Eney Jones, talks quite a bit about is when you’re pulling through underneath the shoulder, if you can get a shoulder, elbow and hand to line up as you’re in about this position here, then you’re in the strongest position possible. We want one, two, three all lined up, mostly because of the angle of the forearm and the hand there, the direction that that’s facing. Now, this is the before shot. You can see on that right side pretty close but that right hand’s out in front. If we look at the left one here, I don’t think we quite get it. No, same thing there, so that hand’s just out in front a little bit. So in the after shot when he was really getting the high elbow position happening, you can see what happens here. Alright, there, that little bit closer to getting it all lined up. Very close to having it lined up and this left side, I think this one’s, yeah, good, you can see that too, pretty much all lined up, so that’s another thing that has probably contributed to going from 127 down to 121. So there are a couple of things there. Now if you like this video make sure you subscribe, like the video, we do videos like this every week, plus I’m gonna be doing a few more videos during the week too so I’ve had a few recommendations from you about what sort of videos you’d like and I’m gonna create a few more videos on breathing, some strength training for swimming and a host of other things so thank you for watching. I hope you’ve enjoyed this video here and just remember, that it takes time to change habits, swimming’s a learned skill, so you can improve if you’re stuck at a plateau, you can definitely improve, you’re not just stuck where you are. It does take time, practice and hard work and you do need to be in the pool at least three times a week, that’s my rule of thumb, so make sure you are putting in the hard work and then look at what are some of the, maybe the technical things or the mobility or the strength that might contribute to helping you improve your times and improve your swimming. So thanks for watching, make sure you subscribe below. I’ll see you next week with another Feedback Friday video.